YvesArt.com is a registered trade mark of Yves Fine Paintings & Trompe L'Oeil Inc.
WE RECOMMEND THAT YOU USE A PROFESSIONAL WALL PAPER INSTALLER. INFORMATION IN ORDER FOR MANUFACTURER’S WARRANTY PROTECTIONS TO APPLY. If the wallcovering is installed in a manner other than that recommended by YvesArt.com, it is done at the sole risk of the installer and YvesArt.com’ warranty protections do not apply. Use of a mold inhibiting primer product and the use of an adhesive containing a mildew inhibitor is recommended. A. All hanging surfaces must be clean, smooth, dry, undamaged, free of mold, mildew, grease or stains, and structurally intact. All loose paint and other wallcoverings should be removed. If moisture is present, immediately identify and eliminate the source(s) of the moisture and verify that all wall surfaces are completely dry before proceeding. B. Any mold or mildew MUST be removed from walls and hanging surfaces prior to installation. Walls should not contain in excess of 4% residual moisture content. A moisture meter should be used to determine moisture content. Moisture infiltration and accumulation can lead to mold or mildew growth and must be corrected PRIOR to the installation of the wallcovering. If you are unsure if moisture problems are present, consult a qualified professional before proceeding. This product is intended for use in buildings that are properly designed and maintained to avoid moisture infiltration, condensation and or accumulation at wall cavities and wall surfaces, particularly in warm, humid climates. Walls should also be treated with bleach, Lysol and/or other approved, mildew –inhibiting products in order to inhibit further mildew growth. YvesArt.com will not be responsible for any performance and/or quality issues if moisture problems are not addressed before installation, and/or if the building is not properly maintained to prevent moisture infiltration following installation. C. Proper surface preparation is key to getting great results. To prepare the surface properly, we recommend that you prime all surfaces with a universal, white-pigmented, mold inhibiting wallcovering primer. D. Use only a lead pencil for marking walls and back of wallcovering. Do not use ballpoint or marking pen, they will bleed through the surface. E. Do not install wallcovering unless a temperature above 65º degrees F is maintained in both areas of installation and storage for at least 48 hours prior to installation. Hang wallcovering with a premium quality heavy-duty clear pre-mixed adhesive. Use of a mildew inhibitor in the adhesive is recommended as above instructions. Do not dilute adhesive. Brush an even coat of paste over entire back of wallcovering. Pay particular attention to run over edges so they are sure to be pasted. Book material for ten minutes. A. Before cutting, examine goods to make certain pattern color is satisfactory and as ordered. Please refer to the design sent with your mural. B. Check all roll tickets to determine if more than one run number (lot number) of the same pattern color is to be hung. C. Align the Giclée with the line indicating the overlap at the bottom and top of each piece. Overlap both piece and cut the Giclée between the overlap. Remove the excess part on both pieces. 1. When installing textured or non-matched patterns, reverse hanging of alternate panels is required to ensure color continuity from strip to strip. 2. Determine whether the pattern match is random, straight across, or drop match. Measure the wall height, allowing for pattern match, add 4 inches, and then cut the wallcovering. 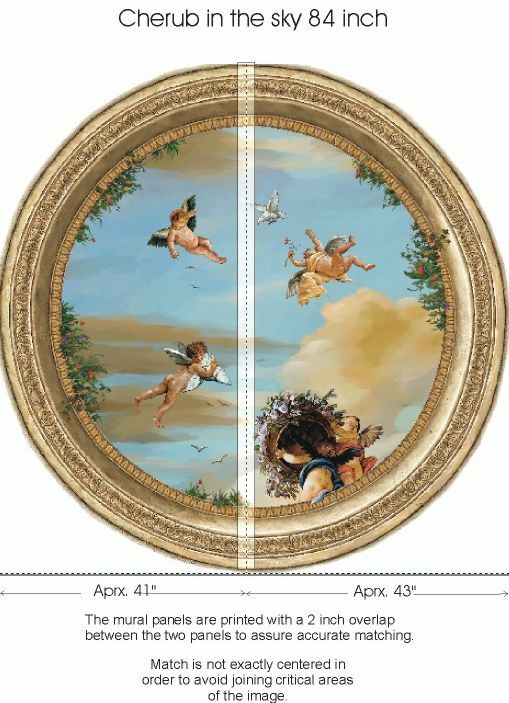 It will overlap onto the ceiling and the base approximately 2 inches. 3. Apply the recommended adhesive to the back using either a pasting machine or a paint roller. Work the adhesive in, to cover the back completely, especially near the edges. Fold each end toward the middle, pasted sides together, aligning the edges carefully so they do not dry out. CAUTION: Do not crease wallcovering. Allow to “relax” for ten minutes (booking). This will allow the adhesive to penetrate the wallcovering fabric, which is important to a successful installation. 5. Avoid burnishing the face of the material. Use a wallcovering brush or a plastic scraper to smooth the wallcovering onto the wall. 6. Do not rub. Do not allow vinyl adhesive to dry on surface as it may leave a white residue. Wash off excess paste from face of wallcovering as you hang it with a cellulose sponge. The cellulose sponge must be rinsed in clean water after every use. Blot dry with a clean cloth. 7. Overlap the second strip over the edge of the first strip. Tape seams underneath with a low adhesive tape before overlapping and double cutting to avoid getting adhesive on the wallcovering. If paste does get on the vinyl, clean it off immediately with clean warm water and blot dry with a clean lint less towel. Use a soft bristle brush to wash the ceiling and the baseboard to remove any paste residue. Do not leave any overlap on the seams since vinyl will not adhere to itself. *Seams should be vertical, have a tight fit, and be free from air and paste bubbles. Seams should not be located closer than 6” to corners. 8. After installation, the walls and wallcovering should be monitored for potential moisture or vapor infiltration or accumulation. Any such infiltration/accumulation after installation must be promptly eliminated in order to reduce the risk of mold/mildew growth. following the recommended preparation and hanging procedures outlined in the installation instructions, and are adequately maintained and used under normal conditions. Ordinary dirt and smudges can be removed with a mild soap and warm water. Clean from bottom of wall upward. Rinse thoroughly with clean water from the top down using a sponge. Deeply embossed wallcoverings need extra attention in case suds or loosened dirt lodge in depressed surfaces. Dry wallcovering with a soft lint free cloth or towel. For more difficult stains that are only surface deep, the use of a stronger detergent is recommended: however, the manufacturer’s instructions should be followed carefully. Not recommended for cleaning are steel wool or powdered abrasive because they mark the surface leaving an unsightly appearance. DO NOT use active solvent type cleaning preparations, such as nail polish remover, etc…because they remove print, and/or finish from the wallcovering. Care should be taken that water dripping down the wall does not run behind the floor molding. The molding can be discolored and/or permanently damaged. All stains should be attempted to be removed with soap and water first. Iso-Propel alcohol may set some stains that soap and water may remove.